The Han Mu Do system is created by world renowned Korean Martial Art historian and Grandmaster of Hapkido, Kuk Sool, Taekwondo and Yudo, Dr He-Young Kimm, Founder and President of The World Han Mu Do Association. Han Mu Do is a balanced fighting system adapted from traditional and modern Korean fighting arts to counter different combat strategies in the modern era. It’s techniques are based on the Water Principle, Circle Principle, 9 direction movements and Natural body movements. 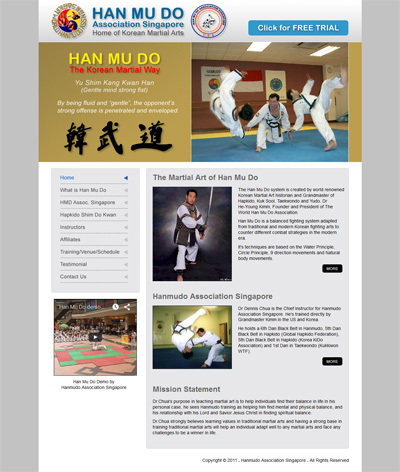 Dr Dennis Chua is the Chief Instructor for Hanmudo Association Singapore. He’s trained directly by Grandmaster Kimm in the US and Korea. He holds a 6th Dan Black Belt in Hanmudo, 5th Dan Black Belt in Hapkido (Global Hapkido Federation), 5th Dan Black Belt in Hapkido (Korea KiDo Association) and 1st Dan in Taekwondo (Kukkiwon WTF). Dr.Chua’s purpose in teaching martial art is to help individuals find their balance in life.In his personal case, he sees Hanmudo training as helping him find mental and physical balance, and his relationship with his Lord and Savior Jesus Christ in finding spiritual balance. Dr.Chua strongly believes learning values in traditional martial arts and having a strong base in training traditional martial arts will help an individual adapt well to any martial arts and face any challenges to be a winner in life.